The United States Mint today at noon ET released the Grand Canyon National Park Five Ounce Silver Uncirculated Coin for a price of $279.95. The collector Grand Canyon coin is the fourth issue in the Mint’s America the Beautiful Five Ounce Silver Uncirculated Coin Program. It honors Grand Canyon National Park located in the state of Arizona. The previous five ounce silver uncirculated coins honored national parks as well, with the first for Hot Springs, the second for Yellowstone and the third for Yosemite. Each of them sold out with their authorized 27,000 mintage, which is the same limit set for the Grand Canyon coin. Buyers can place their order directly from the United States Mint website at http://www.usmint.gov/catalog or by calling the bureau directly at 1-800-USA-MINT (872-6468). There is a one unit per household limit and each domestic order will be charged a $4.95 shipping and handling fee. The Mint is expected to begin shipping orders by July 14. The collector coin comes enclosed in a capsule to protect its finish. The capsule is placed within a protective outer box and accompanied by a Certificate of Authenticity. 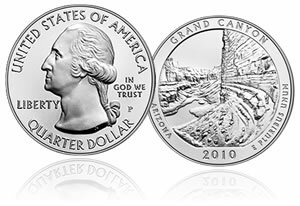 The Grand Canyon National Park Five Ounce Silver Uncirculated Coin is composed of .999 fine silver, has a diameter of 3.000 inches, and a thickness of 0.165 inches. It is, by far, the biggest collectible product available from the United States Mint. Like all of the silver coins in the series, it features the same design as the corresponding American the Beautiful Quarter, including the obverse George Washington portrait. However, while quarters have a reeded edge, the five-ounce coins have an edge inscription of .999 FINE SILVER 5.0 OUNCE. The United States Mint has already sold out of the investment version of the strike, named the Grand Canyon National Park Five Ounce Silver Bullion Coin. It is exactly like the collector piece in all but its finish and mint mark. Both coins are produced at the U.S. Mint facility in Philadelphia, but only the collector uncirculated coin features the additional "P" mint mark. The bullion coin had a slightly larger mintage at 33,000. The Grand Canyon coin reverse, designed by Phebe Hemphill, depicts the granaries above the Nankoweap Delta in Marble Canyon near the Colorado River. Their release dates have yet to be announced.